When it comes to food- I want simplicity. Sometimes we get bogged down by fancy recipes with extravagant spices and ingredients, that we loose the true taste of the food. That’s why I enjoy this recipe so much. 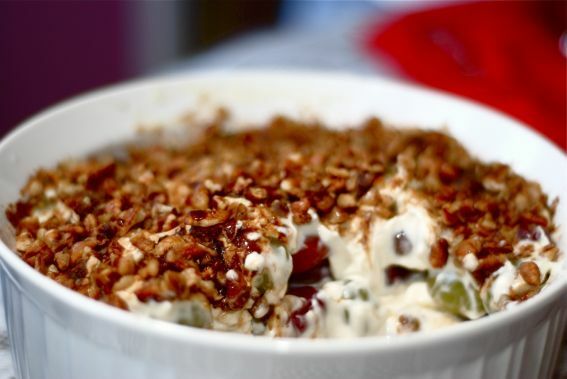 It’s my mother’s recipe for a simple grape salad (that I serve for Christmas dinner occasionally). 1 (8oz.) cream cheese, room temp. Mix cream cheese, powdered sugar and vanilla until smooth. Fold in sour cream and add to grapes. Mix brown sugar and nuts together and sprinkle over grapes.